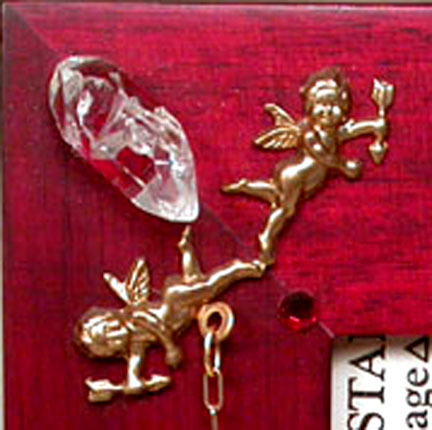 Cupids! Hearts! Delicate wirewrapping and chains...a golden bow! One of kind natural Arkansas rock crystal gemstones with rainbows! Ruby red Swarovski glass rhinestones! 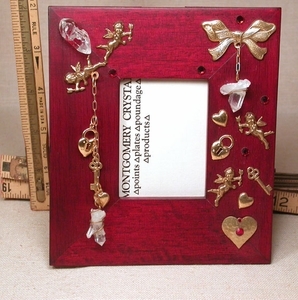 Claret-red handmade wood frame gleams to show off a favorite photo or memento! 2-1/2" glass protected space, 5x 5-3/4" frame. Hearts will beat faster every time you or your giftees glance its' way!